The Automotive Advertising Network (AAN) that is a new dealer advertising platform network was created by Brian Pasch, Sean Wolfington and David Boice, aims to help dealers generate more leads for less cost. The network provides member dealers with unlimited leads and online promotion of their inventory on national, regional and local websites. They are positioned to appear on top of the most popular search engines, social networks and blogs. As in any business, the success is achieved by reaching more customers for less cost. That is what the Automotive Advertising Network does. 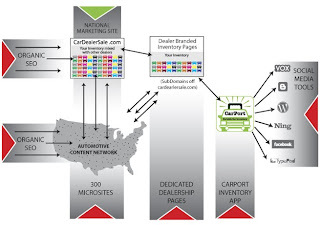 The tool the Automotive Advertising Network uses fo successful completion of work, is that it promotes member dealers inventory nationally through websites like CarDealerSale.com in addition to hundreds of regional and local websites. Member Dealer’s inventory is promoted on search engines through CarDealerSale.com and hundreds of regional and local websites. Members use the networks tools to promote their inventory on the most popular search engines, social media sites like Facebook, blogs and social communities. Members receive unlimited leads from ready-to-buy consumers who are actively searching for a vehicle in their market. Members have access to our national automotive press release publishing network to advertise their sales, promotion and build brand awareness. It is also possible to add your inventory to existing blogs and social media web sites that you own. One can drop inventory on a new Facebook Fan Page tab , Social media communities like NING or popular blog platforms like Blogger, WordPress, TypePad, Vox, Squidoo and HubPages. Dealers’ membership fee is $995, and for this price you can receive: Unlimited leads from ready-to-buy consumers, promotion of dealership and inventory on CarDealerSale.com, and other regional and local websites in their primary markets, promotion of dealership and inventory on the most popular social media sites with Live inventory posted on your Facebook Fan Page, unlimited car inventory publishing on popular blog platforms and WordPress plug-in for optimized inventory listings, banner advertising on the AAN local websites, and finally access to the networks automotive press release publishing system and unlimited press release publishing on national and regional websites. Car detail pages are free from competitor ads. Car detail pages are free from OEM ads. Car detail pages are optimized for local based mapping technology. Every car detail page has been designed for optimal local search visibility (SEO). Every car detail page has a clear phone number, address and link to your website. Your cars appear in national, regional and local websites in the AAN network. Dealers can submit banner ads to be shown on regional portals. Dealers can submit their press releases to be published on our regional portals.